Today’s guest is author Penny Lockwood. She is stopping by Strands of Thought as she tours the internet with her new book Boo’s Bad Day. Welcome Penny. Tell us about you, please. Kai, thanks for hosting me. At the end of the tour, I will pick out one commenter’s name and send an autographed copy of Boo’s Bad Day to a United States address only. If the name I pick is someone who lives outside the U.S., I will send a PDF copy of the book. So remember, readers, be sure to leave contact information when you comment! Penny, tell us a little about you, please. I have published more than 100 articles, 75 stories, a chapbook, and my stories have been included in two anthologies. I write for both adults and children. My fiction has appeared in numerous genre and children’s publications, and non‑fiction work has appeared in a variety of writing, parenting, and young adult print magazines and on line publications. I edit for MuseItUp Publishing. Visit my web site at http:// pennylockwoodehrenkranz.yolasite.com. My writing blog is located at http://pennylockwoodehrenkranz.blogspot.com/. I have recently released Boo’s Bad Day with 4RV Publishing and have three other children’s books under contract with them: Ghost for Rent, Ghost for Lunch, and Many Colored Coats. I have three romances published by MuseItUp Publishing: Love Delivery, Lady in Waiting, and Mirror, Mirror. My short story collection, A Past and A Future, is available through Sam’s Dot Publishing and Smashwords. 1. Study the English language and learn proper grammar, spelling, and punctuation. Don’t rely on your computer’s grammar and spell checker. 2. Accept constructive criticism. Be willing to listen to what your critique group, beta readers, and/or editors have to say to make your manuscript a better story. 3. Learn how to study publishers’ guidelines and catalogue offerings to find the best fit for your manuscript when you’re ready to submit. 1. I love to garden. It gets me outside, gives me some exercise, and rewards me with beautiful flowers and delicious vegetables and fruits. 2. I enjoy walking. This also gets me outside and gives me exercise. In addition, I can listen to the birds, think about stories I’m working on, and clear my head. 3. I spend a lot of time reading. I read for pleasure, and I also read to keep up with what is current in the genres in which I generally write. I could probably read from sun-up until sun-down and be perfectly happy. Unfortunately, chores and work get in the way. Top 3 hit songs from when you were in the age range of your target audience. I’m not sure if you would classify these as “hit” songs, but when I was a toddler and in kindergarten, these are three of the songs my friends and I sang and enjoyed. Thanks for charming us on this week’s Three Times A Charm, Penny. Thanks for coming by on your tour! Good luck to you and Boo. Hi Kai, thanks for hosting me today. I love the idea of your three times a charm questions. It really mixes up the usual questions and answers. I'm glad you enjoyed it, Penny. Gives us a peek at the person behind the books, too. Glad you and Boo could visit. The cover is so adorable! I can't imagine a kid passing it up. Thanks for stopping in, Rena. Hi Rena, thanks for stopping by and commenting. I appreciate so many of you offering to host Boo and me during our tour. Another great interview, Penny and Kai. Gardening and walking are wonderful to free the mind and relax the body. And reading also works. Very enjoyable interview, ladies! 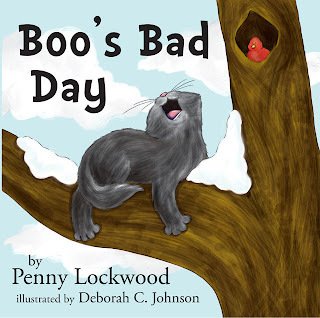 Boo's Bad Day looks like such a cute book, and having the top 3's is a nice way to learn a bit more about Penny. Thanks for sharing, Kai! Connie, nice to "see" you here. Thanks for commenting.